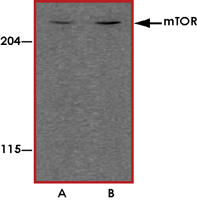 Sample Data :Western blot analysis of mTOR in L1210 cell lysate with mTOR antibody at (A) 1 and (B) 2 ug/mL. 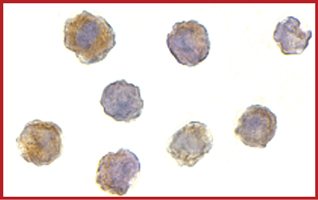 Sample Data :Immunocytochemistry of mTOR in L1210 cells with mTOR antibody at 2 ug/mL. 1. Shamji AF et al: Integration of growth factor and nutrient signaling: implications for cancer biology. Mol. Cell 2003; 12:271-80. 2. Sabatini DM et al: RAFT1: a mammalian protein that binds to FKP12 in a rapamycin-dependent fashion and is homologous to yeast TORs. Cell 1994; 78:35-43. 3. Cardenas ME et al: Molecular mechanisms of immunosuppression by cyclosporine, FK506, and rapamycin. Curr. Opin. Nephrol. Hypertens. 1995; 4:472-7. 4. Fingar DC et al: Target of rapamycin (TOR): an integrator of nutrient and growth factor signals and coordinator of cell growth and cell cycle progression. Oncogene 2004; 23:3151-71.